You can now download the Stoic Week 2015 Handbook via the links in this blog post. 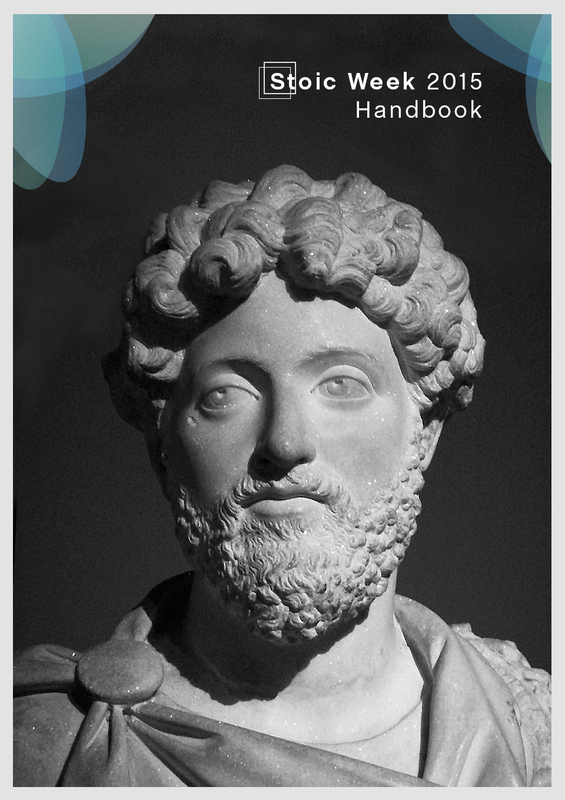 The Stoic Week 2015 Handbook is now available! Mark, I fully appreciate your comments. It is little wonder that Stoicism has similarities to the later Perennial Philosophy seeing as how Stoicism emerged from the ‘common perceptions’ of Zeno’s time. As to if the later attempts did as well as Stoicism in bringing together the common ground of the various wisdom traditions I have no idea as I have not looked into such. A very good modern book that touches on the subject is “Harmony: A Vision for Our Future” by HRH Prince Charles the Prince of Wales co-written with Tony Juniper and Ian Skelly. There is much in Prince Charles’ approach that is Stoic. He is definitely a philosopher prince. When it comes to my attempts to avoid the use of the words ‘prayer’ and ‘worship’, I get into all sorts of trouble because I try to use words that do not carry the ‘baggage’ that some traditional words carry. To me, ‘prayer’ tends to suggest a monologue or petition with the petitioner being ready to sit back and be miraculously served up an answer or a solution on a plate. I talk of a ‘conversation’ because I see such as a two way process. Invariably, what we pray for is only achievable if we participate in striving for it. There is a whole essay needed to discuss the ‘etiquette and protocols’ that enable the supplicant to benefit from such a conversation. Such need is also why the Stoics of old looked into matters such as ‘personal daemons’, oracles and the like. Again, to me ‘worship’ tends to carry the suggestion of organised group ritualistic practices. Again I talk of ‘honouring’ rather than worshiping for, to my mind, in Stoic honouring there are no such connotations. The living conscious Cosmos, the Divine Fire, the Deity – all words denoting the same state of being. We are ‘sparks of the Divine Fire’ – that is we are the children of the living conscious Cosmos and the living conscious Cosmos is our spiritual parent. Honouring the Deity, for the Stoic, will include adoration and respect, just as one would show adoration and respect to the wise amongst one’s family or ‘tribe’ and, for the Stoic, the deity is the wisest member of our family. In addition to adoration and respect, as part of the honouring, the Stoic also experiences awe when it comes to appreciating the all-encompassing nature of the Deity and will possibly be drawn to offer up hymns and poetry in order to try to express some of what they feel. An example is the Hymn to Zeus by Cleanthes, albeit that I find it a little over flowery and rather toadying for my taste. Thanks for the thoughts, Nigel. This is fairly similar to the way I see it. It also has similarities to the Perennial Philosophy, to certain Hindu notions, etc.—for my money, all useful metaphors for thinking about the metaphysical reality of which we are a part but which we can never get a fully objective view of. As for worship, prayer, etc., my own opinion is that worship can be a valid response to the situation. If we are a part of the divine, that means we are less than the totality, and the overall creative force, the divine source however we imagine it, probably deserves a nod of gratitude and respect, however simply or elaborately expressed. And I think the “inner conversation” you describe is prayer and most religions would recognize it as such. The fashionable reflex to simply dismiss “God talk” as rank ignorance is dismaying (though I will note, that attitude seems to be waning some). I’d rather see these historical ideas, the cosmologies of the ancients, handled with more frankness, less knee-jerk repudiation, and a touch more humility. If we learn anything from Socrates, it’s that people are wise only to the extent that they’re conscious of their ignorance. We can’t know everything, so a strong dose of humility in these matters is appropriate. Thanks Mark for the links to the translation tool. It will probably prove to be of use in the future. As to the jump from ‘the daimoni within’ to ‘the reason within’, this would work if translated as ‘divine reason within’ so linking it back to the Whole as is the intent. The attempts at inclusiveness in many modern translations lead to a watering down of the link to the living conscious Cosmos, yet it is only through this understanding of the absolute monism of the Cosmos and hence our absolute oneness with the Whole that a real understanding of many of the Stoic teachings can be fully understood. The Stoic honours the Whole, of which they are a part, by recognising the Whole as the One God, the All. They honour the whole by living their lives as ‘a spark of the Divine Fire’ – that is, by following their moral compass while trying not to let their individuality get in the way of their oneness with everything and everyone around them. Our lives become our ‘religious practices’ and with God being ‘within’ we have no need for prayer – all we need is to have an inner conversation between us as the individual and us as an aspect of the living conscious Cosmos so linking us to a wider spectrum of consciousness than that which we experience as individuals. Socrates listened to ‘his daimon’ that used to guide him because it knew more about the world than he could possibly know from his personal experience, so we also can listen to a wider spectrum of consciousness than that contained within our individual brains. This is the part of the Stoic teachings that many try to ignore despite many renowned professors telling us that such belief is necessary for all of the rest of the Stoic teachings to fall into place. Sorry to go all preachy but the subject in hand does lead to the need for such clarification so that the full intent of the quote can be understood. Stoicism needs to be studied and practiced as a theistic/pantheistic belief system whereby we recognise and honour the Consciousness that manifests both us as individuals and the Cosmos as a whole – just as the Stoics of old believed. You’re right, Nigel. I was looking at the wrong word. It’s all Greek to me! (sorry). The paragraph in question is here. We’re talking about the second-to-last word in the paragraph. Clicking on that takes you to the definition, here. See the “Show lexicon entry in…” links for more detailed treatments. The upshot is, it looks like a fairly straightforward word for god (and goddess), divinity, deity, etc. I would understand glossing Logos as “reason,” but the route from diamon to “reason” seems more than a little tortuous. But I am, as previously stated, out of my depth. Thanks for the thoughts, Nigel. Yes, I have a handful of translations on hand as well, and all of mine are similar: the guardian-spirit, the spirit within you, your own deity within, the divine spirit within, the deity within you. I understand about the Stoic’s Divine Fire, Logos as reason, etc., and doubtless that’s the connection that’s being drawn/implied here, but I’m ignorant enough about the original language, and curious enough, to wish for a more technical explanation. I’m hopeful that someone who knows Greek will chime in here. What is the word being translated here? Is it eudaimon? (I was trying to suss it out in Greek versions online, but it’s out of my reach.) When a Stoic used such a word (daimon), was he referring primarily to “reason” or to something more along the lines of spirit, deity, etc.–i.e., something beyond the reach of reason and more rightly understood as providence, the divine, etc.? The word being translated is ‘daimoni’ according to the Loeb Classical Library’s original text. It definitely does not have the ‘eu’ at the start, although I have no idea what the addition of the ‘i’ at the end denotes. But looking at the cross referencing in this C R Haines translation I get the impression that we are talking about that ‘spark of the Divine Fire’ that is in each of us albeit that he translates it as ‘genius’ in inverted commas as if he was not sure that such was anything more than an approximation of the intent. Not being able to read the original language, I rely on the translations by experts. However being translations, the experts do sometimes find that they are having to translate the intent rather than individual words as written. For this reason I read as many translations as I can lay my hands on. Quite clearly there are slight variations in the translations but they both seem to show that the translation ***‘the guardian-spirit [reason] that dwells within him’*** as used in the Stoic Week 2015 Handbook is a slightly watered down version that seems to side step the Stoic teaching that ‘reason’ as identified by the Stoics of old is seen as ‘the Divine Fire’, or in other words the Stoic view of the Deity and that ‘thy own daemon’ is the ‘spark of the Divine Fire’ within each of us. As it is written in the Stoic Week Handbook it could be taken as talking only of the individual’s own inner ability to reason, whereas Marcus was talking about one’s personal connection to the ‘reason’ that is an aspect of the manifestation of the Cosmos – the active principle of the Divine Fire seen as God as we Stoics see It. ‘Strive to live only the life that is your own, that is to say, your present life; then you will be able to pass at least the time that is left to you until you die in calm and kindliness, and as one who is at peace with the guardian-spirit [reason] that dwells within him’ (Meditations, 12.3). Alas, I can’t read Greek, so my question: What is the word that is translated here as “guardian-spirit” and which you have glossed as “reason”? Is it eudaemon? If so, how do we arrive at “reason” as an accurate synonym? Pingback: Books on Stoicism: The Classics | Think. Play. Train. Pingback: Stoic Week 2015 (Thursday): Virtue, Value, Legend | Ginger IS The Professor! Where is your Facebook share button, please? At the bottom of each blog post. I couldn’t agree more Nigel and I am grinning broadly over the subjective comment regarding your approval 🙂 This year’s Handbook will be cherished by me and I shall pass it on to anyone eager to learn more about this wise approach to life. Thank you Patrick and all the Stoicism Today team. I have just read the Stoicism Today 2015 Stoic Week Handbook from cover to cover. Even if you are not taking part in Stoic Week this year, it is well worth a read. I personally could find nothing to disagree with – and coming from me that is high praise indeed! Next to no technical words – and expressed in plain understandable English. Nearly everything a person needs to know about Stoicism in order to live the Stoic life presented in one short booklet. My congratulations to the Stoicism Today team. Pingback: Blog Forecast for the Week: 100% Chance of Stoicism | Ginger IS The Professor!